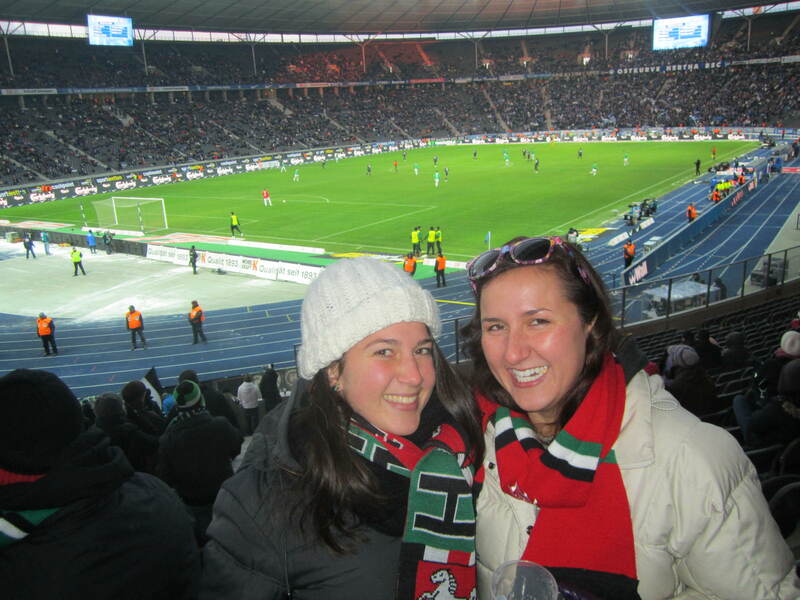 February: The first weekend I went up to Berlin and attended my first Bundesliga (German soccer league) game! Hertha BSC (Berlin) vs. Hannover 96. 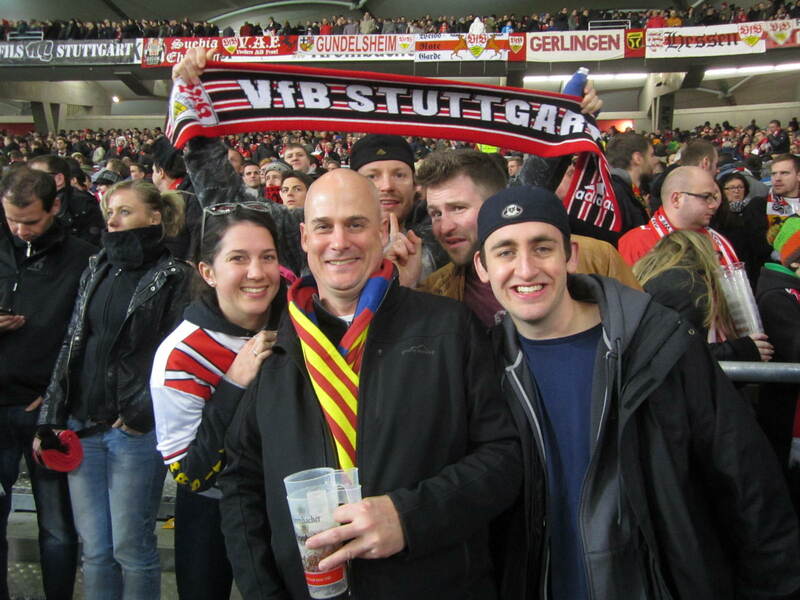 We sat in the Hannover fan section with some friends of ours from Hannover and had a great time (Hannover won). The weekend was a mini-reunion of sorts, my friend Rob (who lives in Hannover) and Becca (in Berlin), both from USA Starz Lacrosse last summer were there, as well as Laura from BC who lives in Paris. I actually got to stay with Laura overnight in Paris on my way back to the States for Christmas (thank you, 16 hour layover). Needless to say the weekend in Berlin was a big success and lots of fun. Wednesday (the 29th) I flew off to the States to surprise one of my best friends for her 6th birthday (okay 24th, but she’s a leap year baby). After much confusion and tears regarding the air traffic control strike at Frankfurt which resulted in my cancelled flight, I rebooked out of Munich and made the 30+ hour trip, getting into Las Vegas approx. 2 am. Almost everyone but the birthday girl knew I was coming, and the surprise was completed on the casino floor of our hotel (the Palazzo) around 2.30 am and our girls weekend in Vegas was off to a running start. I had absolutely no time for jet lag, not to mention I didn’t know what time it was half the time without clocks and windows in the casino, so it worked out in the long run. I only get to see my closest friends from home/college roommates about once or twice a year, so this trip meant a lot to me and I was so incredibly happy and thankful to get to spend time with them. Our trip consisted of the typical walks along the strip, getting harassed by club promoters, having umpteen options per night, a great sushi dinner, drinks at various bars (the last 2 provided by Kat’s family/boyfriend for her birthday), and of course the hangovers nursed at the pool or in the hot tub with ridiculously expensive bloody marys/mimosas. I wouldn’t trade it for anything. Okay maybe I would have had a little bit less to drink on the last night (Friday) since I was aware I was flying into Denver the next day with one of my old roommates, Steph, to stay with her at her apartment in Keystone for a few days. Poor planning, a hangover, and adjusting to altitude proved to be a deadly combination and left us both in bed Saturday night with lots of Gatorade and sleep. Sunday we went to Breckenridge and just walked around, enjoying the town and the great weather, of course stopping to have some beers on the outdoor patio at a sports bar (perfect Sunday, if you ask me). Monday Steph had to work, but her friends saw to it I got my skiing in! First time back up on the slopes in probably 5 or 6 years (that’s embarrassing) and I was so nervous beforehand, but everyone was right, it comes back to you just like riding a bike. 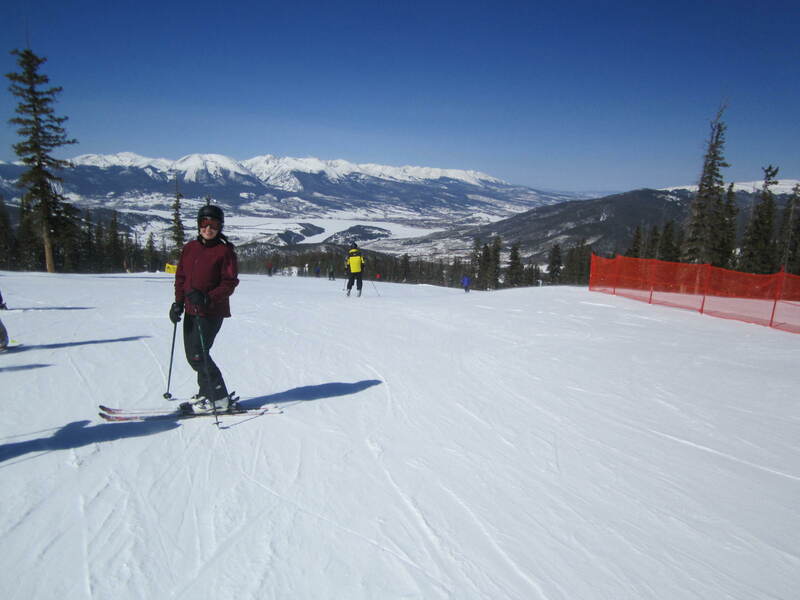 I felt like things came full circle, since Keystone was where I learned to ski back in 4th grade. Took some early runs down Schoolmarm and worked my way up to some steep blues by the end of the day. It was great getting to see where Steph lives and meeting her friends, and to be honest Denver (along with Seattle) has always been on my list of places I’d like to live. We’ll see when I end up back there next. Done yet? Nope, told you it’s been a while. At least we’re into March! Made it back to Germany after a whirlwind week in the US and quickly readjusted to life, leaving me with the feeling that the trip was just a dream. Thursday was back to work and Friday was down to Stuttgart for my second-ever Bundesliga game with my guy friends (no games in the past 1 1/2 years then 2 in a month!? I know). We had a blast seeing Stuttgart and of course drinking in the Irish Pub afterwards. The game itself was boring, a 0-0 tie and they were playing against the worst team in the league. I think the sports announcers referred to it as “one of the weakest Bundesliga games in recent years”. Ouch. I’ve (obviously) very quickly gotten back into the working/coaching lifestyle, with a big change coming up. I’ll be starting to teach at the University (!! I know!) next semester (starting in April). It’s just a one-semester position for the moment, but as always, I’m staying flexible and keeping my options open so who knows where I’ll end up. For the moment, it looks to be more teaching and coaching, but I’m excited to see where it all heads. So, since moving over here my life has mainly consisted of teaching English and lacrosse. When I stopped playing after high school in 2006, I never imagined I would return to the sport this way to both play and coach. I’ve enjoyed it immensely; it’s brought me some of my closest friends over here and amazing opportunities to travel and meet people. That being said, I’ve started working with the European Lacrosse Federation (ELF), which does a lot of work with newer, inexperienced teams and helping them get off the ground. Since that’s basically what I’ve been doing since last year, I had the chance to assist at a camp in Mainz in August then coach my own in October in England. Obviously, being a great Bears fan I knew the game was that weekend and had tried to get tickets beforehand but they were too expensive. So I vow to come back to Trafalgar Square later Friday night where it turns out, they’re hosting fan fest. I hop on a boat and make my way over to Greenwich (pronounced “Gren-itch” for all you non-east coasters) where yes, Greenwich Mean Time comes from and they also have a great market set up with various sellers and an array of international food. (Let’s just say Germany’s food variety is lacking and the Ethiopian food I had for lunch in Greenwich was amazing). I make it back to downtown London in time for fan fest where everyone naturally has to wait in a line to get in and be searched which takes forever. 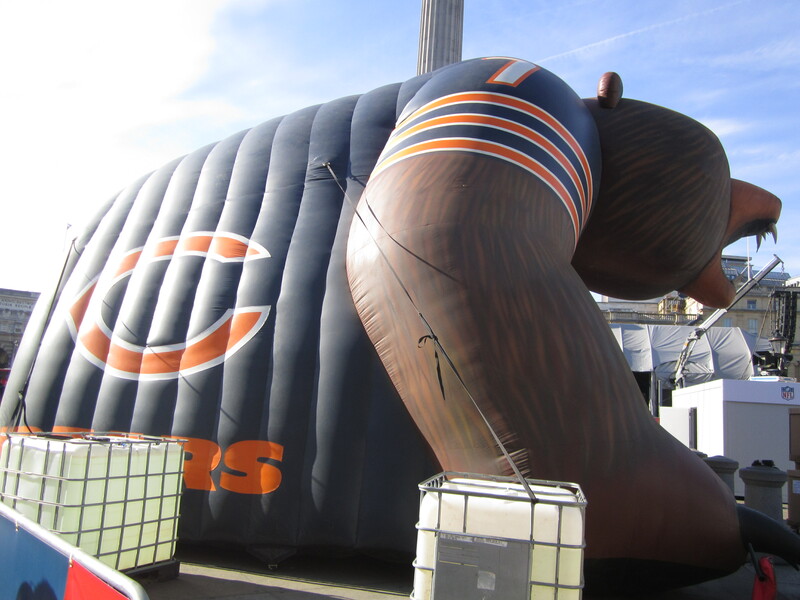 So I strike up conversation with some Bears fans I see (Chicagoans are all so friendly. Don’t believe me? Come visit. Or read the rest of this post). Once I get in, I naturally head over to get a beer (where they’re only serving Bud Light. Ahh.. America’s finest. We wouldn’t want quality European beer or anything). Now, I mentioned the fact that I’m more than okay traveling alone because most Americans are downright terrified of it and/or assume something is terribly wrong when they see someone traveling alone. Example: The group of Bears fans I was talking to before I went in see me buying a beer. One approaches me, asks me who I’m there with and is shocked when I answer with “no one.” They politely invite me to hang out with them for a bit, which I politely accept. “A bit” turns into “Friday early evening until Sunday night”. They took me under their wing and we had an amazing weekend from going out Friday night, shopping and pub-hopping on Saturday which brings us to Sunday: camp and game day. The lacrosse camp went well, a smaller turnout than I expected, but the drills I prepared went over well and it ended with an invitation to come back and do another camp sometime. 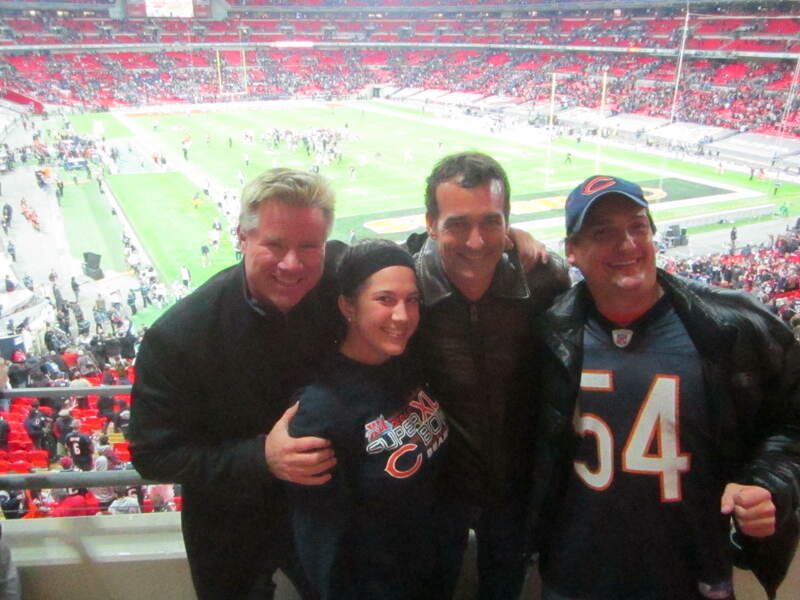 I made a last-minute decision to make the trip out to Wembley Stadium (where the Bears game was) and try to scalp a ticket (the guys I was hanging out with already had theirs) and if it worked, great, if not, I’d go to a bar nearby and watch the game. I somehow have great luck an manage to score a club-level ticket (face value, 130 pounds) for 70 pounds. The guy who sold me it even walked me to the door and waited for it to be scanned for me to give him the money. Now I was alone in the classy club area, but not for long. The guys in front of me notice my Bears shirt, turn around and ask me where I’m from. Obviously they’re from Chicago as well, we start chatting, they take care of my beers for the rest of the game and I have yet another group of new friends. Needless to say this trip was a huge success overall, and it was amazing to get some quality time with a bunch of Chicagoans- in London. Who woulda thought? It made me really appreciate coming from Chicago/the Midwest and the generosity and friendliness showed from every Bears fan I met. 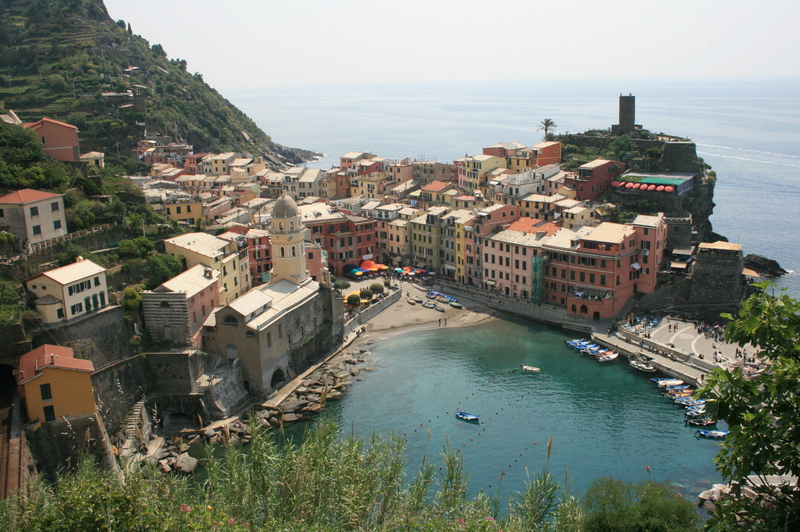 Cinque Terre is someplace I’ve wanted to go ever since before I left to study abroad in the spring of 2009. 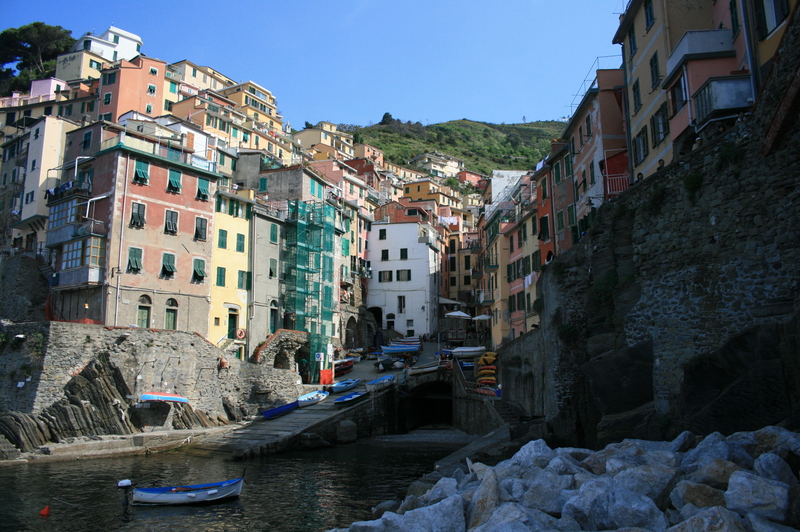 When I said I’d be traveling around, more than one person highly recommended Cinque Terre in Italy, a cluster of five small towns along the west coast between Genova and Pisa. After doing a bit of research I immediately wanted to go and vowed I would get there at some point. It worked out perfectly that Amanda had scheduled her spring break to end there and I was more than happy to accompany her and her friends. Okay well on a much lighter note… I had the last two weeks free for Easter break!! I could really get used to the German school system here, about 6 or 7 weeks of school then a 1 or 2 week break. 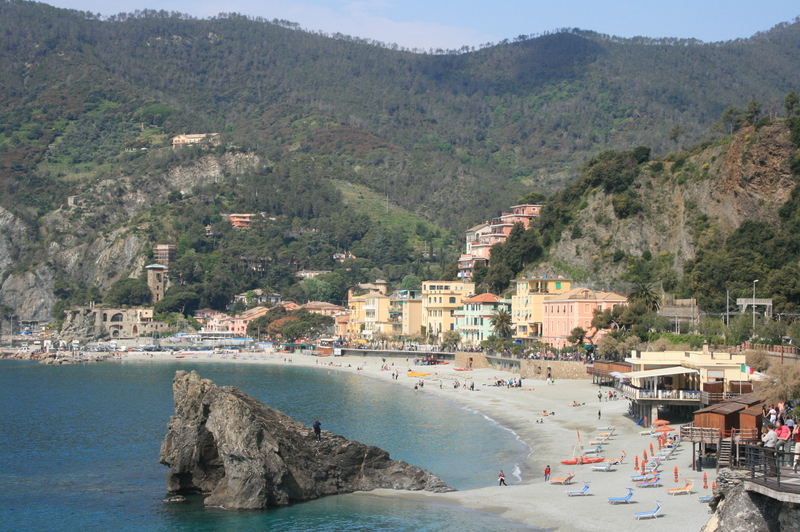 I’ve got another 2 week break coming up in June, travel suggestions welcome. So the first week of break was relatively uneventful, just stayed in Würzburg and caught up on some rest, tv, made carrot cake (!! my cooking skills are steadily improving) then jetted off for the second week. Landed in Malta late Friday night and after ten very anxious minutes of me not being able to get into my hostel, all was well. 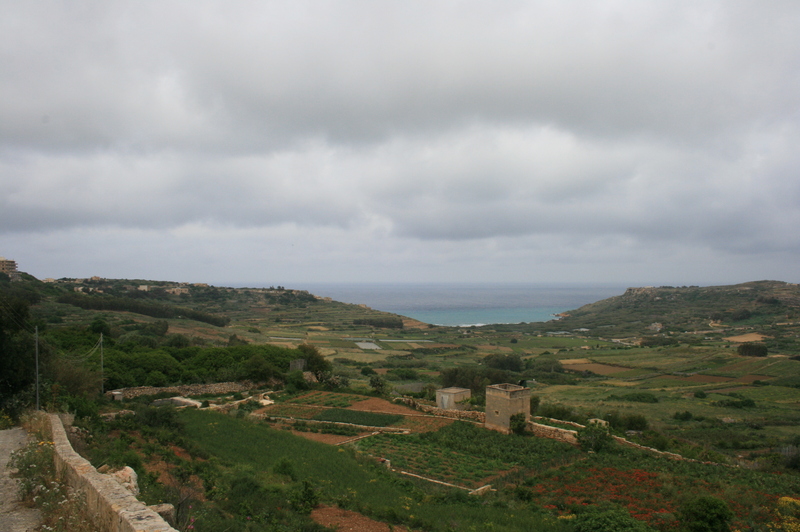 How did I end up deciding to go to Malta you ask? I decided to join up with Amanda, a family friend who is studying abroad in France, and a group of her friends- all Notre Dame students by the way- and despite my BC status we got along well. 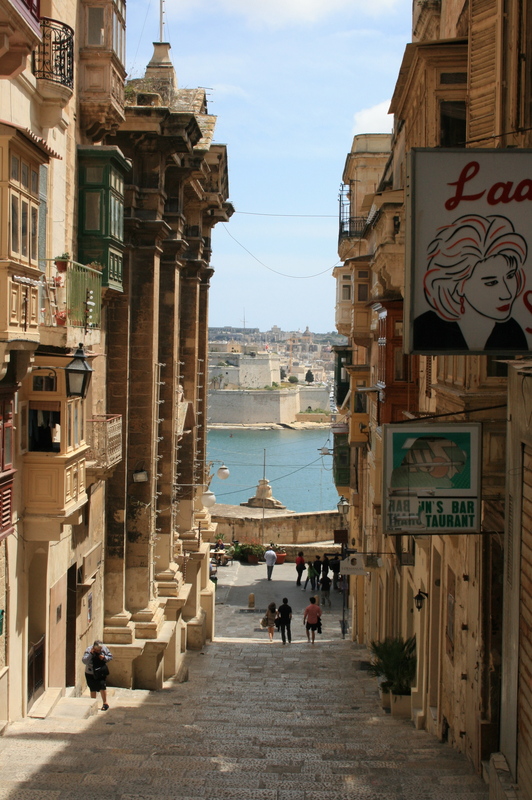 Explored Valletta, the capital city, by myself the first few days since the girls weren’t getting in until Sunday/Monday. 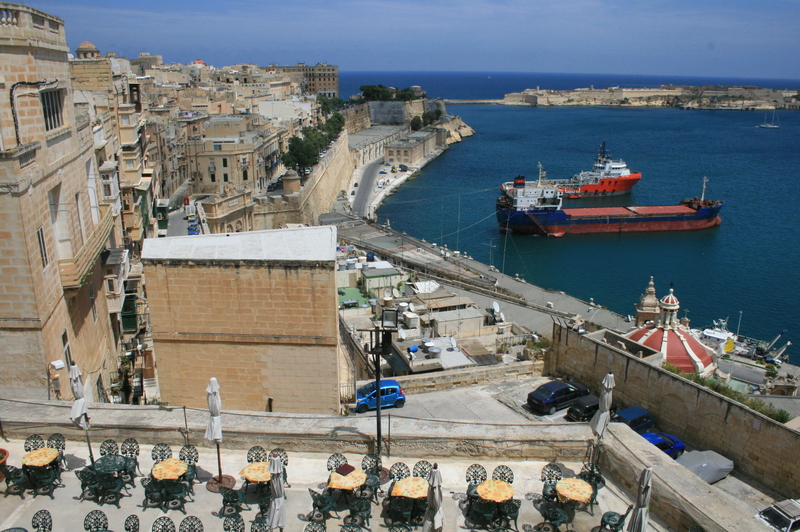 Went to a disappointingly small and not very ornate Easter mass at St. John’s Co-Cathedral, enjoyed the sun at an outdoor cafe, went to a few museums (National Museum of Fine Art- good exhibit on Mucha, the Czech father of Art Nouveau and National Museum of Archeology, which was basically like Guns Germs and Steel -Malta style-in museum form. Sidenote- I recommend that book for anyone interested in human geography/sociology/in general) The island is beautiful and although not very large, still has a lot to offer. 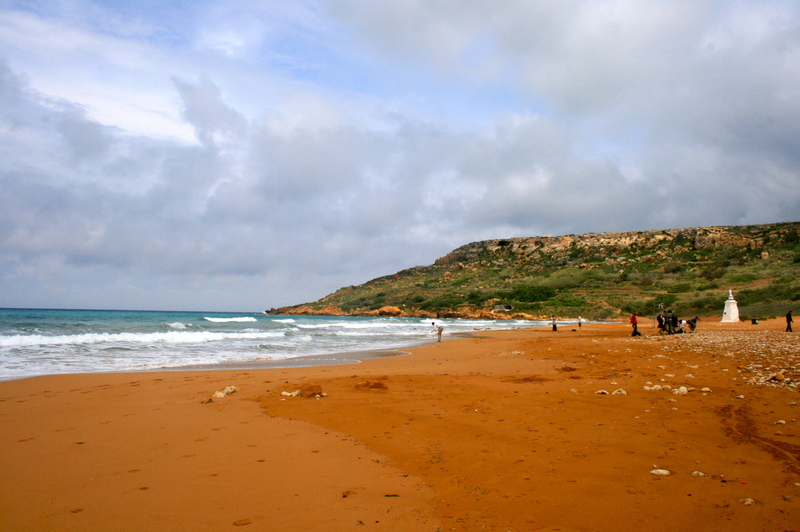 Monday I did a day trip to the center of the island (I was staying on the East coast) to the towns Mdina and Rabat. I use the term “day trip” loosely because it took about 30 mins by bus to get there, but is still considered a trip on the island. Mdina is a tiny city, completely walled, no cars allowed. Took me about 20 minutes to walk the entire thing- went in the cathedral (of course) and the museum where I actually found myself liking Dürer’s wood-carving prints (never thought I’d say that after my Art in Munich course). Walked over to Rabat and went down into St. Paul’s catacombs- the thing’s pretty big! (obviously can’t be compared to the catacombs in Paris, but still) Almost all “attractions” in Rabat are named after St. Paul since he was shipwrecked off the coast of Malta and supposedly spent time in Rabat. Malta reminded me of a mixture between Egypt and Portugal. Which, after my visit to the Archaeology Museum, proved not to be too bad of a theory (Malta was invaded/taken over by various groups from both Europe and Northern Africa). The driving is much safer than in Cairo (no fend-for-your-life defensive driving) but they still don’t follow road signs/lane lines. The city was mostly a tan/brown color (also like Cairo) but really hilly (Lisbon). The port/seaside was beautiful (Lisbon, also Alexandria), but given the fact I was there on a holiday weekend, it was hard to get a feel for the city life since not a lot was open. Saleswoman: Oh yes it protects against both. 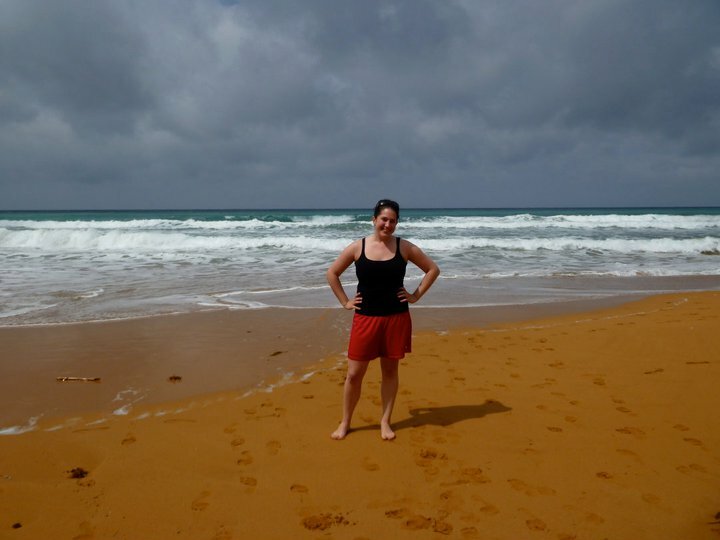 *looks me and my pale Irish skin up and down*… Where exactly are you traveling? Me: I’ll be in Malta for 6 days then going to Italy! Saleswoman: Yeah… you’re going to want to buy SPF 50 to use at least for the first few days then you can shift down to SPF 30. See that cove all the way in the back? 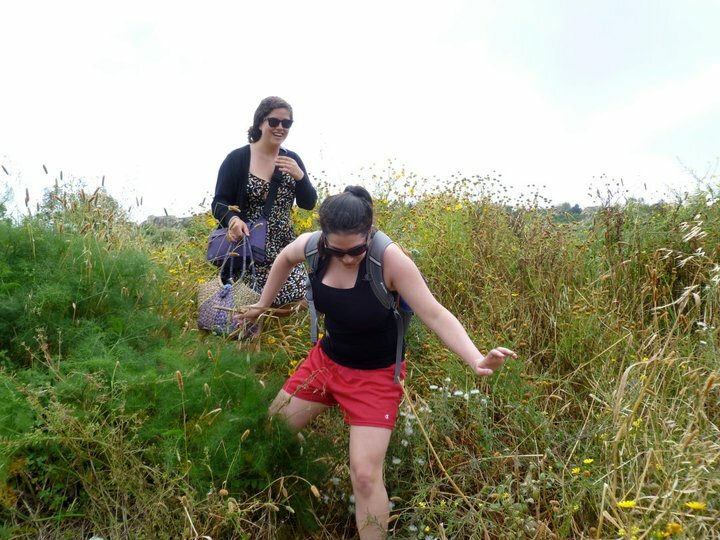 Yes, we trekked there. And I mean trekked. 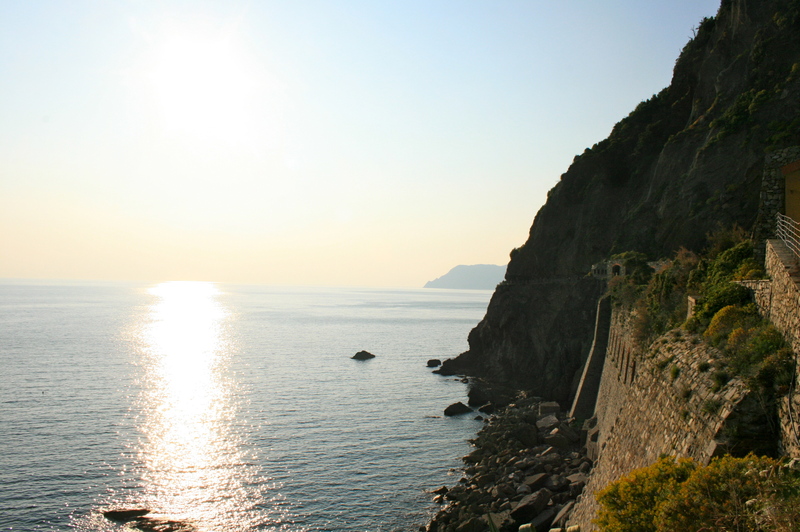 The bus only runs during the high tourist months (June-September). The road was long and winding and would have taken much too long so we found a footpath through the land which looked promising. Okay so a lot has been happening in the past few weeks including the Fulbright seminar in Berlin, a weekend trip to Copenhagen afterwards, and lots more around Wuerzburg. I’m going to save the Berlin seminar for a separate entry since I want to do it justice. So I’ll work backwards and start with stuff that’s been going on around here then go onto the Copenhagen trip. School’s been going really really well lately. I kind of fell into a funk in February where I was a little bored with my schedule, wasn’t really feeling challenged, and was wondering if staying for a second year was a realistic option. But since I’ve gotten used to my new schedule for this semester, it’s been great. The kids are so talkative and I’ve had some really great conversations in my classes, especially with the 11th and 12th grades. They’ve watched An Inconvenient Truth in class and we had a great discussion about global warming (right up my alley), and in practicing for the oral exam at the end of the year, the students have shown themselves competent in current events knowledge ranging from Gutenberg’s resignation due to plagiarism to the earthquake in Japan and debating about nuclear energy. Also on that topic, at least for the past two Monday’s there have been rallies in town protesting the use of nuclear energy in Germany. Chancellor Merkel did temporarily suspend activity at a few plants after the earthquake in Japan, but people speculate it’s only for political reasons (especially since the greens just took power in Baden-Wuerttenburg, traditionally a conservative stronghold). But the debate on nuclear energy hasn’t been pushed to the back burner yet here, and people are adamant about reducing the amount used since the waste poses such strong potential danger. It’s been interesting to witness the reactions, especially since I get the feeling people are more directly politically involved here than back home. Lacrosse has had its ups and downs. We’re in the semester break right now (school doesn’t start back up again until May 1st. Crazy, I know) so attendance has been low at practice. But in the past week we’ve gotten a few more new players, so it’s nice that I can devote my time and energy to them at practice instead of worrying about running practice and teaching the game. Our team is looking into ordering jerseys (!!) and I’m still trying to organize practice games. I actually get to play this weekend which I’m so excited about! I have a friend who plays for Kaiserslautern, and they won’t have enough players this weekend so she asked if I could play with them. (Since I’m not officially registered with a team, it’s not a problem for me to get a player pass through her team). We have two games in Karlsruhe on Sunday against Karlsruhe and Munich II, my former team! I’ll be heading out to Erlangen on Saturday to watch the men’s team play so hopefully I’ll have lots of good news to report after! Last weekend we had an international film festival here in town, and my Canadian friend and I went to see an Italian film (with English subtitles) about four guys who travel across their small island by foot to reach and perform in a music festival. It was pretty entertaining. Afterwards we went to Hettstadt, a nearby town, for an astronomy viewing night. My friend is doing her PhD in Astrophysics, so there was no shortage of knowledgeable scientists on hand to explain the constellations, planets, etc. There was one HUGE telescope and about 3 large ones (all bigger than any I’ve ever looked through). We could see the moon up close, craters and all, and saturn with its rings! I loved the astronomy unit back in the 6th grade- 6th grade science was the best, what with that, anatomy, ecology, a frog dissection, and we were still young enough to watch Bill Nye in class. Awesome. The weather here has been amazing, bordering on summer, which was a really really nice change from Copenhagen. I dumbly didn’t realize just how far north it is, and it was definitely still winter when we were there (last weekend in March). 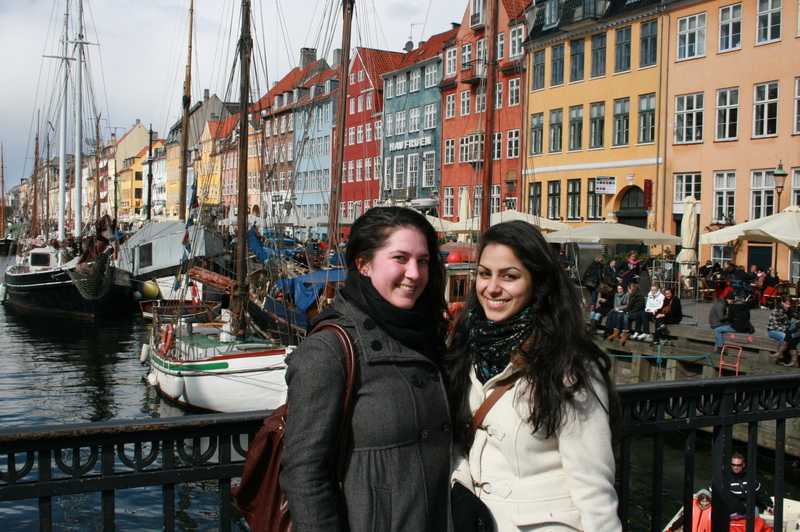 Nadiya and I headed up there from Berlin after the seminar and spent Thursday-Sunday in Copenhagen. I liked it, but if I ever go back it’ll have to be in the summer months. I just got the feeling that there’s a lot more to do/the city’s more enjoyable in warmer weather. But we still made the best of our time there. We ate a lot of traditional Danish open-faced sandwiches, though I didn’t go so far as to have any with raw fish on them. 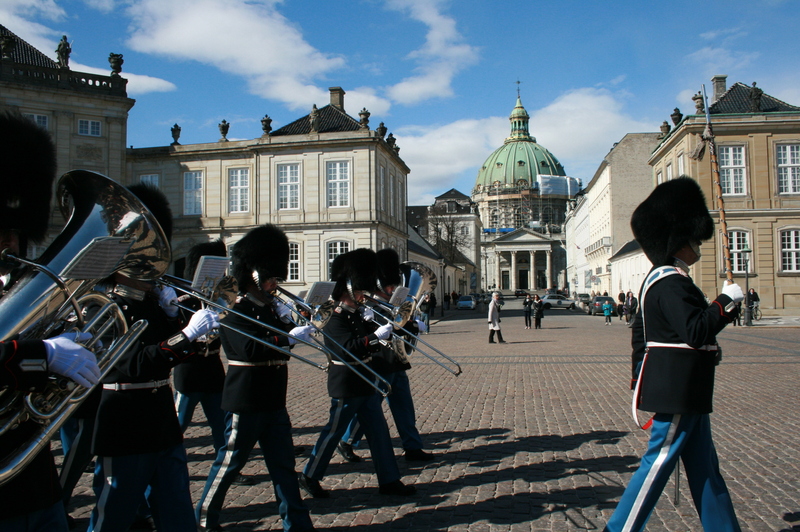 We went to the Royal Palace and watched the changing of the guard, walked along Nyhaven (the part along the canal with all the colored houses) and took a boat tour of the city. We also visited quite a few museums but I’ve got to admit I really enjoyed all of the exhibits. My favorite were probably the motion of light exhibit, the best photographs of 2010, and the Picasso exhibit out at the Louisiana Museum. It was unbelievable and had so many of Picasso’s famous works, as well as information about his life. Our last night there, Denmark was playing Norway in a qualification match for the European Cup in 2012 (this is soccer we’re talking about here) so we asked at our hostel where a good place would be to watch it and found ourselves in a small, crowded smoky pub where we were the only tourists. It was awesome. The Danes speak English better than probably 70% of Americans (it’s unreal) so we had no problems communicating and quickly made friends at our neighboring table. We played some strange dice game after the game was over (if you watch Pirates of the Caribbean, it’s the dice game they play in the second movie where Will tries to win the key from Davy Jones), and after we all moved on to a bar to celebrate one of the guys birthdays. I made it to the train station the next morning in time for my train and promptly fell asleep (as I do on any means of transportation) only to be woken up about 3 hours later by some woman telling me to go upstairs. Our train was stopped in what looked like a lit-up tunnel and there was almost no one left on the train. Groggily, I grabbed my bags and followed the last few passengers up these stairs only to find out that we’re on a boat. Our train had driven straight onto a ferry which was now carrying us across to Germany. What?!? I was pretty confused/astounded for the first five minutes, but eventually got used to it. When the boat landed in Germany, the train was already lined up with the tracks and simply drove off the boat and on to Hamburg. I’ve got the next two weeks off for Easter (yippee!) so I’ll be updating a little bit more regularly (although there probably won’t be too much to update on). Bis dann! So, we had the first full week of March off for our “Winter” break here in Bavaria (it’s really spring break, but whatever I’m not arguing details) and my original plan was to travel solely to Portugal. Then due to a culmination of factors, including but not limited to cheap flights, gatherings of friends, Hoboken St. Patrick’s Day, and travel opportunities, I decided to add New Jersey/New York into the mix. I left early Friday morning (mind you, I hosted an American drinking games seminar at my place Thursday night- not the best timing on my part) and landed in Newark, New Jersey Friday afternoon! First time back in the US in over six months and it was exciting but weird- not to speak English, but to hear others around me always speaking English as well as seeing my friends again. Looking back on it, the whole thing feels like it was just a dream. After I landed, I made my way over to Hoboken where I stayed with three of my guy friends who went to BC. Various other additions of friends as well as people I didn’t know proceeded to make their way over to the apartment throughout the night and it ended up being a good time. Mind you, I was proud that I somehow stayed awake until midnight without napping which proved to be the best thing to fight off any potential jet lag. Saturday morning we were up early (about 7) and ready to take the first Irish car bombs at 8. Sunday the weather perfectly reflected everyone’s hangovers moods and proceeded to downpour the entire day. I said bye to Jersey and headed into Manhattan. Had a casual night of sushi and New York style pizza for dinner while watching bad reality tv with most of the group from the bar the day before. Monday wasn’t too exciting except that I finally got my laptop fixed! I wholly appreciate the Genius Bar as well as the ability to explain the problems in English. I took advantage of being in the city and the nice weather and explored a bit (but not too much since I was lugging my suitcase everywhere) and later met up with Becky (my other half while studying abroad) after work! We met up with another friend for drinks after work (it feels so grown up saying that) then off to dinner where yet another friend joined us. Seriously, it was a great extended weekend for seeing/catching up with friends. Tuesday came and after a relaxing morning and extensive shopping in Soho (Forever21 anyone?) it was time for me to leave the US yet again, at least until July. But don’t worry, my spring break adventure isn’t over yet. After my overnight flight, I landed in Lisbon Wednesday morning! I wasn’t meeting up with my friend until later so I explored the city by myself for most of the day. I took the Santa Justa lift (100 year old elevator which still functions) up to a platform for a great view of the city, then walked around to find some ruins and a cathedral (of course) which I went in and walked around (you’re welcome, dad). I walked down to the harbor/port and sat there for a while enjoying the warm weather. Later I met up with Philipp, a German friend of mine who I stayed with, and we went out to dinner at this great Brazilian-style restaurant. The plate comes with raw meat, a side of sauces, and a steaming hot stone on which you grill your own meat. Amazing doesn’t even begin to describe how good it was. Afterwards, we bought some beer and enjoyed an even better view of the city at night (the views just kept getting better). 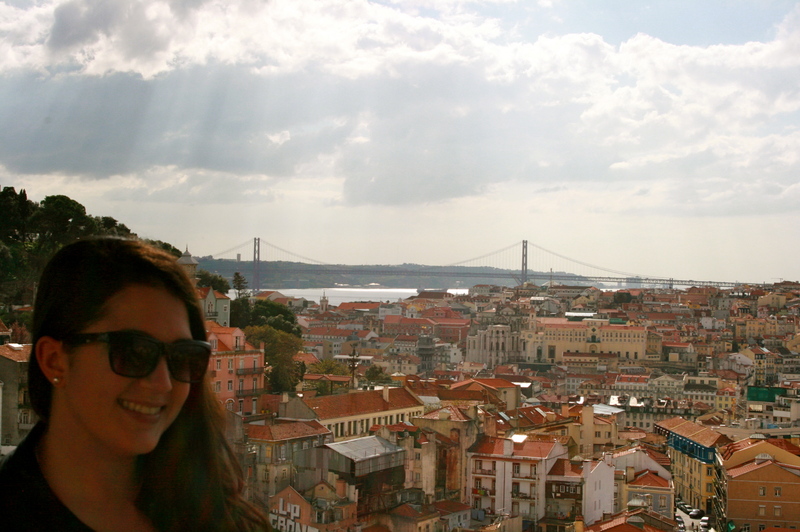 Thursday Philipp took me around the city and it’s safe to say I’m in love with Lisbon. 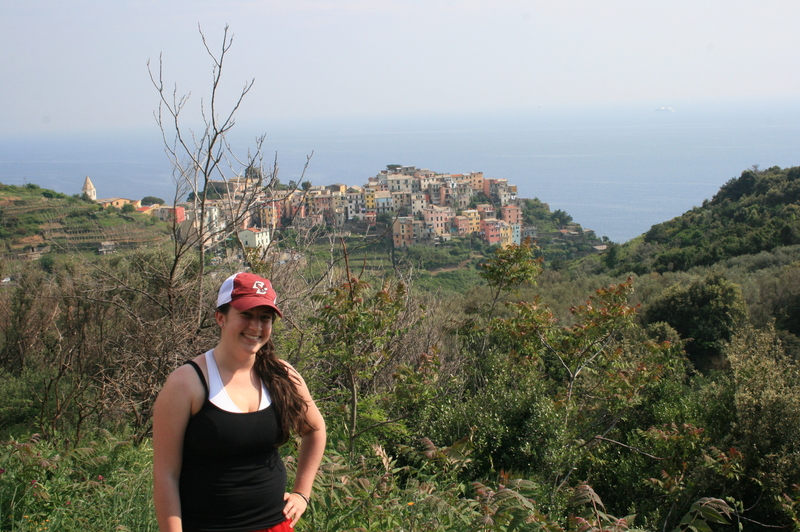 I knew absolutely nothing about it before going, had no expectations, and now I would definitely go back in a heartbeat. We rode the old classic streetcars which are from the early twentieth century and are not really modernized at all. Lisbon may seem small at first glance, especially from some of the lookout points, but it’s deceiving. It’s made up of a series of hills (I think 7?) which makes it much bigger- and confusing- than I thought. The streetcars ride all over up and down the hills and were probably one of my favorite parts (along with the great views). Grabbed some coffee/breakfast in a park then did some more streetcar riding to various beautiful parts of the city. We took the metro out to the World’s Fair grounds (Lisbon hosted in 1998) which is right along the water. As Philipp explained to me, the theme of that year’s worlds fair was the ocean and everything was somehow connected to it. Thursday was much more relaxing (not that any of this is stressful). Philipp had an interview for an internship so one of his roommates offered to make me lunch. She made some traditional Brazilian food (there was no shortage of good food this trip) and Philipp returned by the time we were done. Since he had rented a car for the day, we went to one of the premier attractions- the mall! We met up with two other friends of his since they had to go wetsuit shopping. The three of them were going to learn how to surf on Sunday at their friend’s beach house (yeah, their study abroad year has been really tough). 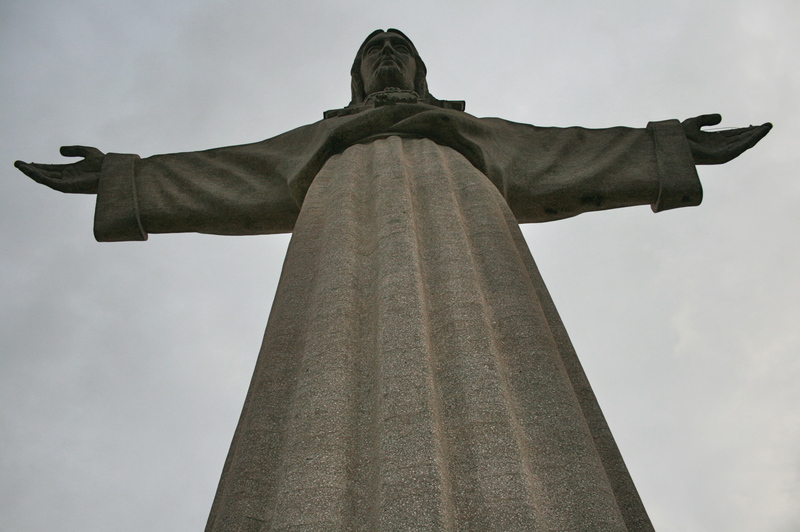 After that fun excursion the four of us drove across the bridge to Cristo-Rei, or the Jesus statue. Yes, it looks exactly like the one in Rio de Janeiro but was surprisingly built after (and is 2 meters shorter, I think). 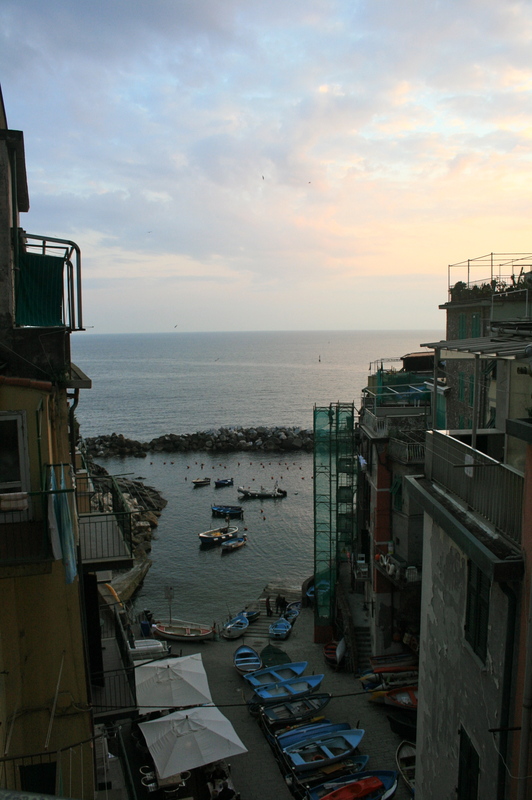 Thursday night we all went over to one of the guy’s apartments to cook dinner together- shrimp scampi, I was impressed, not to mention all of the seafood is incredibly fresh! We went out that night in Bairro Alto, a really fun area and right by the apartment, and I somehow woke up on time for my flight the next morning. Back in Germany it’s been cloudy and not as sunny, and I’m longing to go back to Lisbon already. This next week will definitely keep me busy (and hopefully give nicer weather? ): I leave tomorrow for Berlin since we’ve got a week long seminar there for the Fulbright program. More updates after I get back! Sorry for the delay in posting, I’ve gotten a little preoccupied with other things (getting a bike, applying to grad school and the peace corps) but more on those later…. 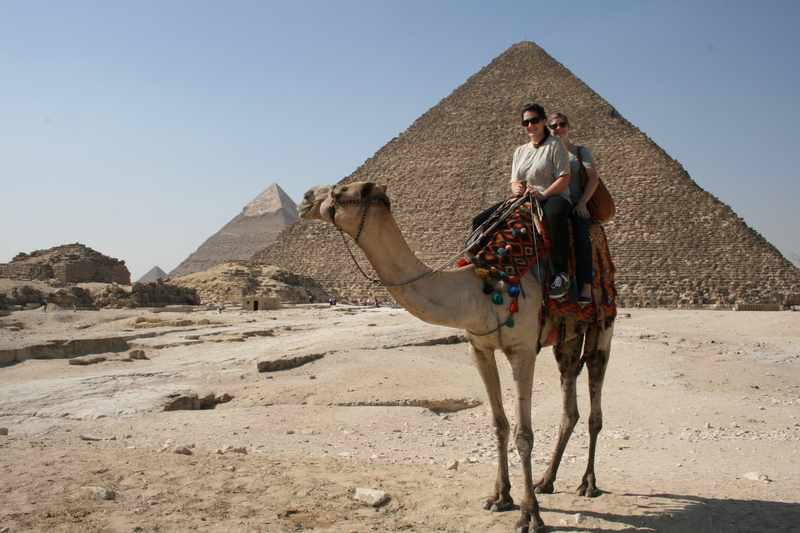 So day two in Cairo: Jessie and I get up and ride the metro to Coptic Cairo. 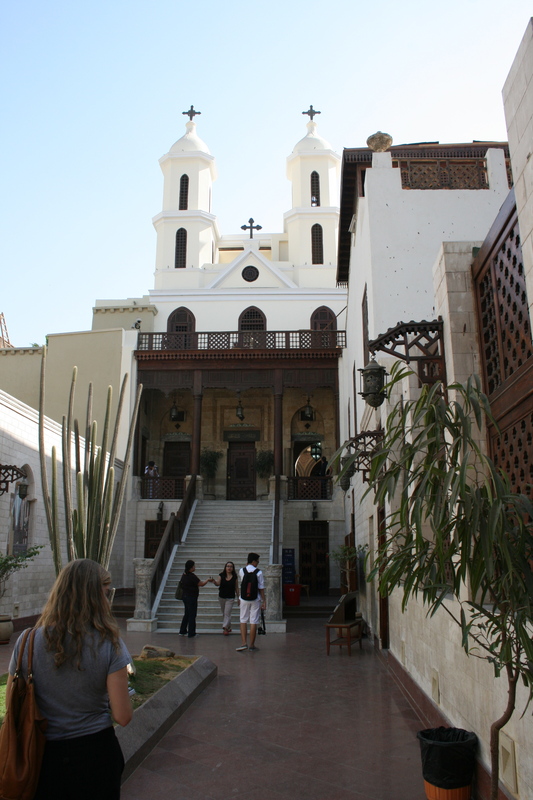 The Copts are Egyptian Christians, and the Coptic area is rumored to have been visited by the Holy Family. We first went to the Hanging Church which appears to be grounded at first glance but due to some sort of architectural magic it’s suspended over a passage. It was, of course, beautifully and intricately decorated, complete with ivory fillings in wooden carvings. From there we walk around the rest of the area which includes more churches and even a synagogue, which was apparently right near the spot where Moses was found in the reeds. We ride the metro back to downtown and walk around for a bit. I should mention the metro experience- they have separate cars for men and women, and Jessie told me that’s a good thing; we want to be in the women’s car. It gets so crowded in the mens car with people pressed up against each other whereas the women’s car has much more space (due to less women riding the metro than men). We stop for lunch and get koshari, a traditional Egyptian food. It’s really cheap, but really filling due to the fact that it’s mostly carbs. I think it was a combination of pasta, rice, lentils, onions, and chickpeas with a garlic and hot sauce. SO good. 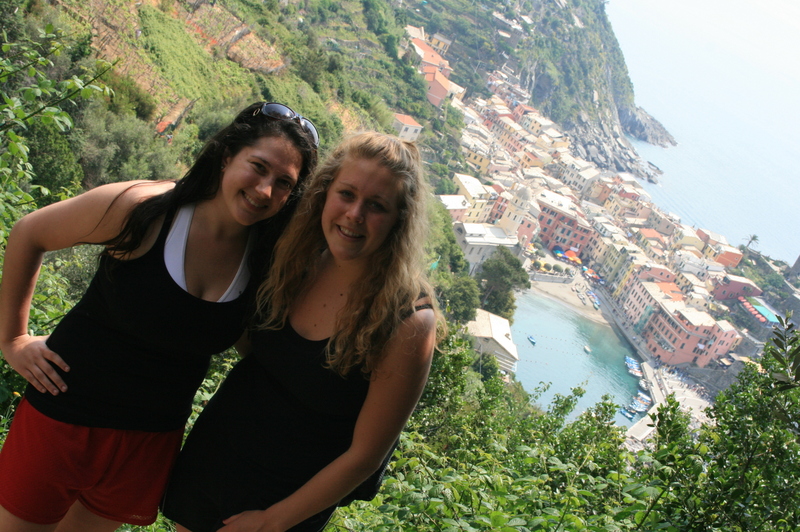 Then we (thankfully) proceeded to walk around for a few hours to burn off our bajillion carbs. It turns out to be one of Jessie’s roommates birthdays, so we all go out for the night to celebrate. We start off by chartering a felucca on the Nile. A felucca is basically a big Egyptian sailboat. The view was amazing, the weather was warm, and I was riding a boat on the Nile at night. Can’t complain. We all went out to a club afterwards and continued to celebrate probably a little too late into the night. 3 hours later we’re up and rushing off to the train station with a friend of Jessie’s, hoping we don’t miss our train to Alexandria. We make it there fine and pass out the entire duration of the 2.5 hour trip. Alexandria is absolutely beautiful. 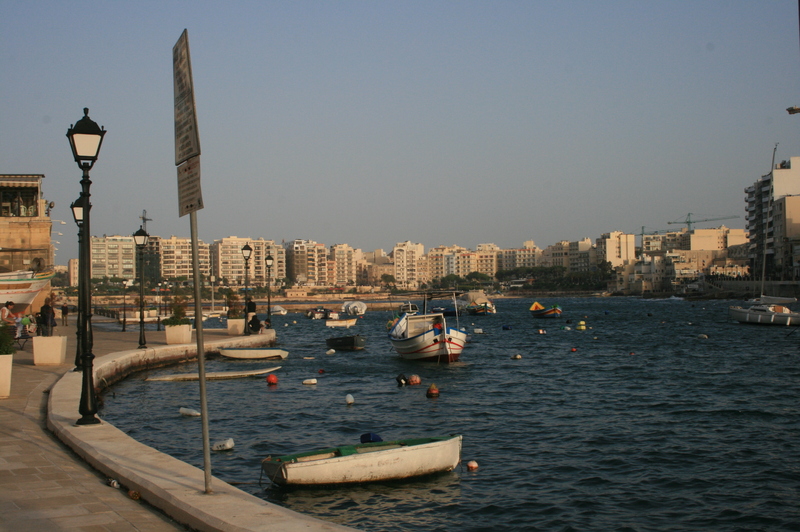 I liked Cairo a lot, but I could see myself living in Alexandria. Right on the water, not as big/crowded as Cairo, great library (obviously a plus for Jessie also). First things first, we get lost trying to find the Roman ruins but wander through a great market nonetheless. Find our way to the Roman ruins, including the Roman Theater, and some of the areas were roped off since there’s still excavation going on. After a confusing cab ride, we arrive at the greatest juice place ever. It’s called “King of Mango” and if anyone is ever in Alexandria I insist you go. From there we walk to a restaurant for lunch which provides another miraculously delicious meal. We selected fresh seabass and crayfish (I think? Not a seafood expert), sit down, and are provided with an array of appetizers- Egyptian bread and a few hummus-like dips. They bring out the seafood and it’s amazing. We didn’t order anything special, just picked the food, and they chose how to cook it for us, complete with spices. 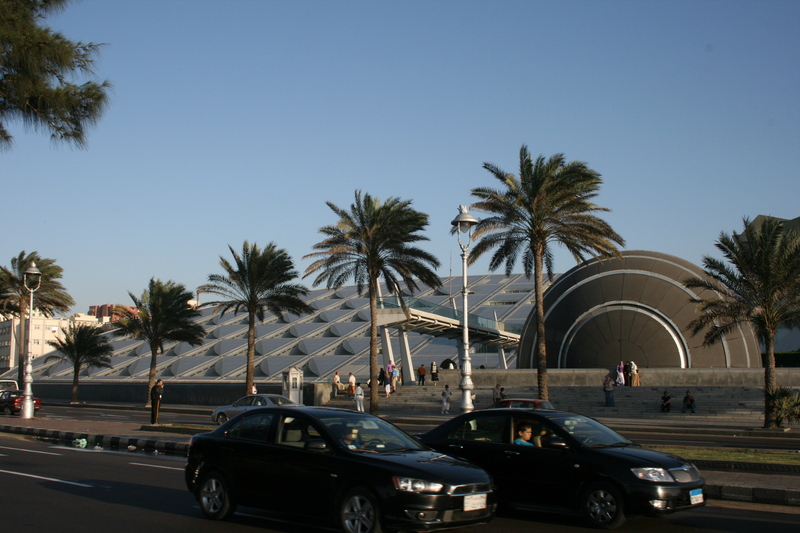 After lunch, we walk along el corniche (the waterfront) to the library. 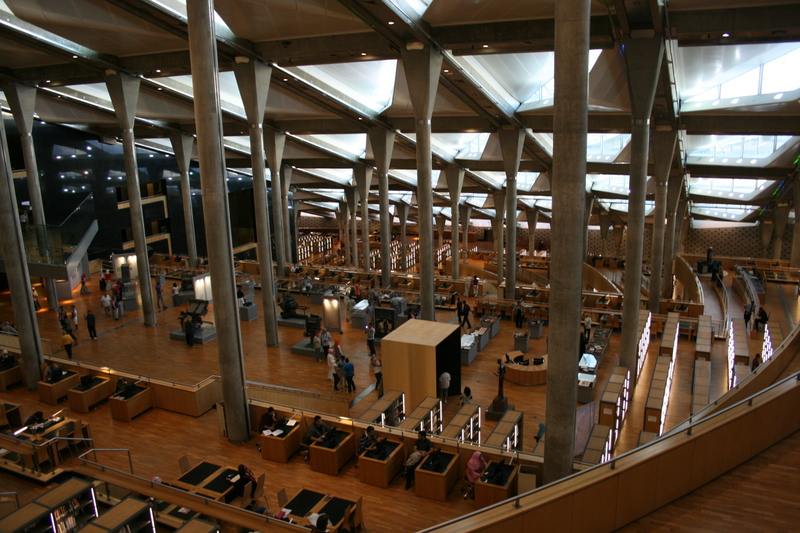 The library of Alexandria is a marvel for both its architecture and its content. It’s second in the world only to the US Library of Congress, and it used to be the biggest/most significant library of the ancient world, before it was destroyed. For anyone who knows Jessie well, you’ll know she loves libraries (especially Bapst) so this was fun for her too. Although, she did say she doesn’t know how much studying she could do there, since there’s tourists coming in and out all the time and taking pictures. We stop for some tea/coffee then make our way back to the train station. Since it’s my last night, Jessie and I go out to a really nice restaurant for dinner. She lives in a section of Cairo called Zamalek, which is an island in the Nile. The restaurant was on the tip of the island, so it’s surrounded by water on three sides. It’s decorated beautifully with billowing white sheets and candles and of course, the food is wonderful. (sushi for Jessie, kabobs for me). Fall break was definitely a success and I’m so glad I not only got to experience Cairo and Egypt but see and spend time with one of my really good friends. Since I’ve been back, nothing too exciting has been going on but it’s starting to pick up. The Weihnachtsmarkt (Christmas market) is under construction and opens any day now which I am so excited for! I’m also hoping to get to Nuremberg for a day to see the big one there. Teaching has been going well, the 11th grade is getting into units on America so for the next few weeks I get to explain the voting process, electoral college (ugh) and civil rights. Any suggestions? I’ve also gotten a bike- one of the teacher’s from the school has loaned it to me for the year- which makes getting into town much quicker (although about equal for the way back home since it’s an uphill ride). Lacrosse continues to go well, I’m scheduling a meeting with the head of University Sport next week to see if we can get our own practice times. We had a “team evening” yesterday with the boys team, and it was fun to get to know everyone/see them in clothes other than workout gear. We’ve got practice tonight, then it’s officially the weekend! I flew into Cairo from Frankfurt last Tuesday and met Jessie at the airport (after a few delays on both sides). Jessie is one of my roommates from college who studied abroad in Cairo and lives there now. It was so unbelievably good to see her. We grabbed some shawarma for dinner on the way back to her apartment (a döner, in German) and just hung out since I got in kind of late. Also- a disproportionate amount of this blog will be dedicated to food. Apologies if you’re hungry. So after our camel ride we see the Sphinx and head back into the city. 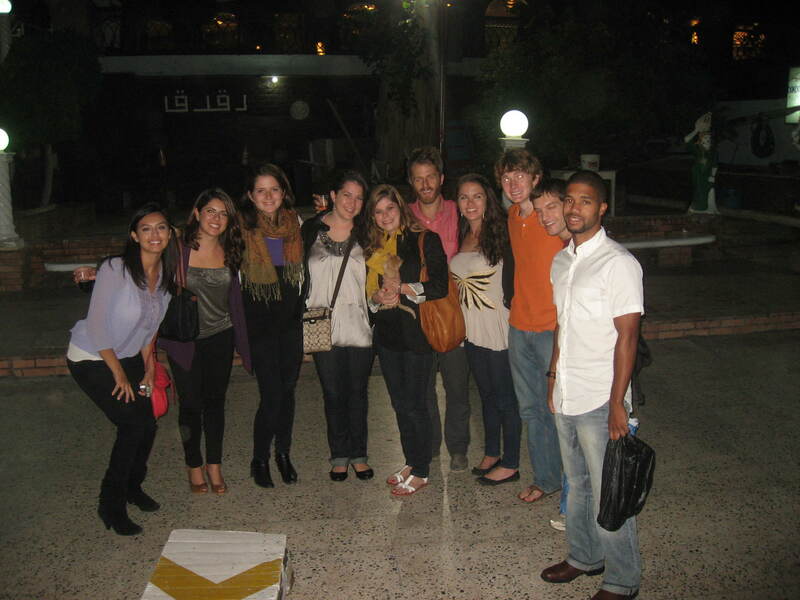 We then embark on a tour of Jessie’s favorite part of the city: Islamic Cairo. (I apologize in advance for the lack of knowledge about the names of the mosques. If I find them I will gladly put them in). We decided to make our way from the north end of the city to the south- those are the locations of Cairo’s two main gates successfully used to protect the city from invaders (you can even see where they spilled hot oil from). Our first stop on the trail of mosques had absolutely beautiful doors (Jessie’s favorite part)- and she tells me that in ancient times, doors were taken and brought back to the city as a symbol of victory. The first mosque was one of my favorites (along with the last one, which is Jessie’s favorite). 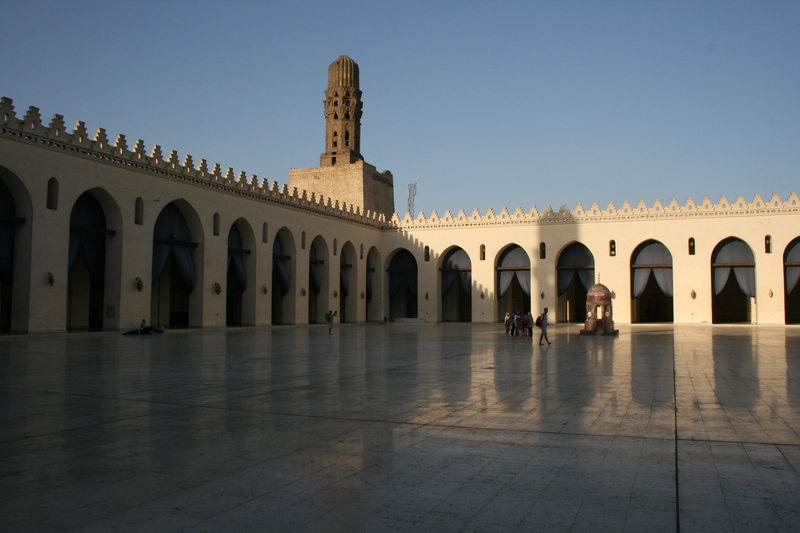 This one had a huge open courtyard with a big fountain in the middle- each mosque has a fountain so people can wash their hands and feet before they pray. 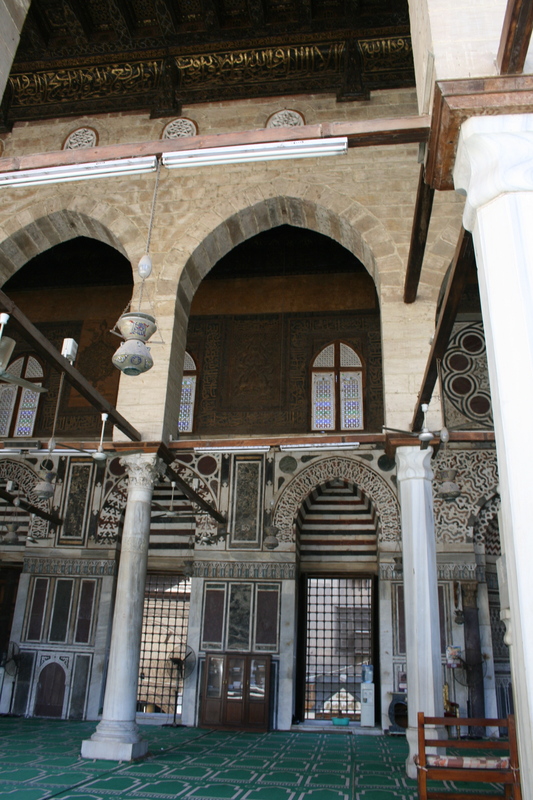 Almost every inch in the mosque, aside from the courtyard, was intricately decorated. You would think all of the patterns and designs would make it look too busy, but it all flowed together really well. Islam doesn’t allow idols or images in the mosques, so instead everything is expressed geometrically, and the hexagon is especially predominant. There were also intricate wooden carvings that used to be filled with ivory, but the ivory was stripped and sold at one point when the mosques were raided. We stopped for lunch at a restaurant which (thankfully) had air conditioning upstairs- Jessie complained it was “cold” aka 80 degrees. Jessie ordered (yay Arabic skills) for us- a hummus-like dip with garlic and pita bread, and a cheese fatir which we split. The fatir is kind of like an Egyptian calzone but has a flaky dough layer on top. Kind of like what you’d find on baklava but not sweet. Oh and we also had good mango juice. Then back through the rest of the market and onto the mosques. We must have gone in at least 7 or 8. Each one was unique- but most had an open-air courtyard of sorts which I really appreciated (it only rains twice a year in Cairo). We even climbed up one of the minarets of one of the mosques which was another one of my top ten terrifying experiences. But the rickety staircase held up and proved to be worth the climb. We could see for miles from the top- I didn’t really grasp the fact that Cairo really is in the middle of a desert until then. Everything’s pretty sand-colored but still nice to look at. We could see the bigger mosques, the path we had walked, and the “westernized” part of town (mostly composed of hotels where foreigners stay). We (safely) climbed back down and went to Jessie’s favorite mosque. It was really beautiful with a huge open courtyard, billowing curtains, and a white marble floor. I can definitely see why she loves it. We relaxed there for a while (not to mention our feet were tired from all the walking) before moving onto the city gate. From there we made our way back into the maze of the bazaar to Fishawi’s- a famous coffeehouse. 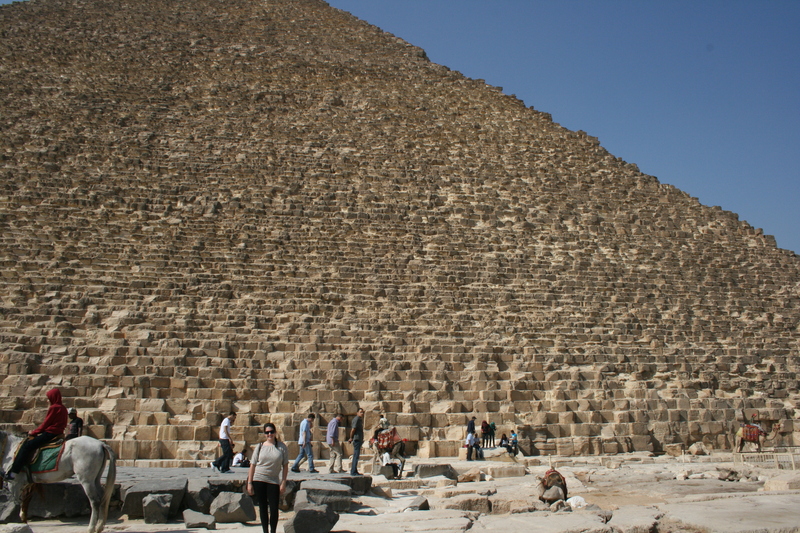 It’s been open for 300 years (it’s open 24 hours, only closed during Ramadan) and is a favorite spot for both tourists and native Egyptians (which is what I think makes it so cool). I had some tea (with mint!) before we met up with one of Jessie’s friends from work to go see a Sufi whirling show. 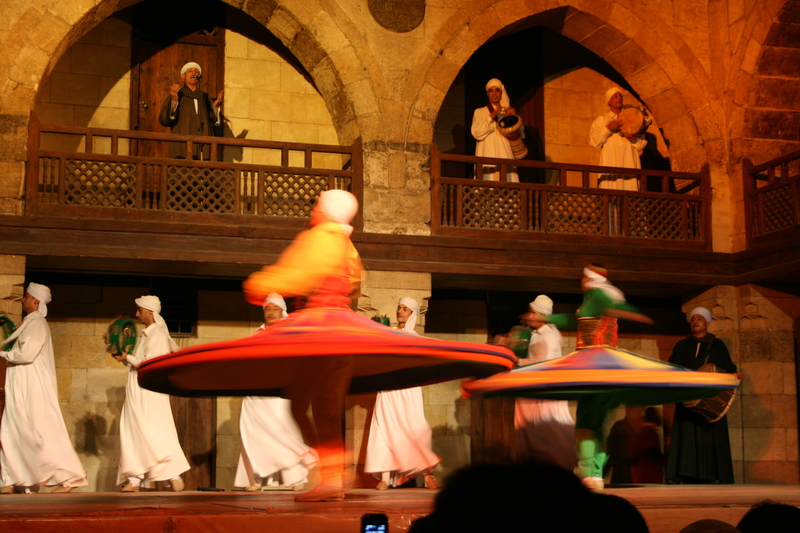 The Sufi are whirling dirvishes who spin to get closer to God. There were musicians too- mostly on drums and an oboe-like instrument- and then a few men who spun. It sounds kind of boring, watching people spin around for over an hour but it was actually really entertaining. The first guy spun for almost half an hour by himself! I have no idea how he didn’t fall flat on his face. The “spinners” wore colorful outfits and multiple layers of large skirts which spun with them, and they removed at certain points throughout the performance. I did get a few pictures where they look still but I feel the ones in motion give a better feel for it. Okay so all of that happened in ONE day (Jessie literally is a master of leading sightseeing). Needless to say we were exhausted, ordered in food and went to bed to prepare for the next few days (more Cairo and Alexandria)! Since this blog has taken me way too long to write (I blame uploading the large-file pictures) I’m going to end it here but I’ll get to part II tomorrow or Saturday! I got a package from home today!! … and I’ve been stuffing my face with peanut butter cups and oreos ever since. amazing. Since Germans don’t celebrate Thanksgiving, Christmas season is in full swing. Don’t get me wrong, I love Christmas, but it feels a bit early for everything…. My attempts to build a lacrosse team are going well- we had 12 girls at practice yesterday which was the same amount the guys had- hah! I didn’t realize that part of my trip would be adding to Colleen’s Blog- but I will indulge her- my apologies to her friends… Tim and I arrived safely in Munich where Colleen met us at the LARGE train station- by an old familiar friend- STARBUCKS. Needless to say after our flight we did need coffee. She helped us gather our luggage and took us to her room as it was too early to check in. We visited for a bit and caught up on all the news- it was so great just to see her 🙂 We took the S.bahn back to Marienplatz, checked in, and walked around the square. We sat at a table for lunch- at which Col ordered so fluently in German for us- the proud mom just beaming at this child who makes it look so easy. The rest of the afternoon she took us around and showed us the university and where she takes classes. The architecture of the buildings is so phenomenal, one building more decorated than the last. We had dinner at a great place called “ocui”, sort of like a “Flat Top” restaurant, the food and the wine were great. Then off to early slumber for the old folks. Day 2 in Munich was rainy, but determined. We went to Fuessen and toured the Neuschwanstein catle. Tim could fill you in on the history of all we saw- I was just in awe of the gold, the decorations, the expanse of the castle. It’s nice to see that some of history is preserved. Tuesday in Munich was… rainy- but the 3 of us went to Salzburg anyway. Saw Mozart’s house, went into a museum to learn of the history of Salzburg (and to dry off), had wonderful pastries at Cafe Tomaselli, then had pizza back in our hotel room where Col caught up on some TV before heading back to her dorm. Day 4 in Munich- Wednesday, didn’t start out early. Col had classes in the morning, Tim and I went to the Alte Pinakothek Museum and saw great artwork- Southern Germany is very Catholic, so a lot of Christ-related them pics- very beautiful and well-preserved for their ages. Tim continued on and I met Colleen after class to go shopping! Very successful. We had dinner with Colleen and her friend Becky where the waiter Tony was flirty with both of them. We had an enjoyable meal, then headed back to our room where we were all able to watch USA beat Spain in soccer! Saturday–> Walked through the Naschmarkt- open food stalls, clothes, and a lot of junk! Colleen did find some nice scarves in bright colors. Another long walk to the Belvedere Palace built 300 years ago as a summer palace for Prince Eugene of Stoy. It houses 19th and 20th centure austrian paintings, specifically Gustav Klimt (“The Kiss”). Beautiful gardens and the sun was actually shining! Next was a jaunt to St. Stephen’s Cathedral after a stop in the Lindt chocolate hop. Had to stock up on “souvenirs”. The Cathedral is amazing- 450 ft tower with multiple architectural styles dating back to 1144 when it was built. We almost were locked in for the 5 pm mass!! Grocery shopping was not easy. The plan was to pick up some salami, cheese, bread, and wine for dinner and a soccer game in the room. The meat counter had over 100 choices of hams, salami, etc and the cheese counter was twice as huge! Colleen made some fine choices. Always easier to order when you have a German-speaking daughter as your guide! Sunday was our third straight day of good weather (only drizzles several times a day with occasional sun). Took the U-bahn to the Schoenbrunn Palace and Park. Spent 2 hours walking the grounds and gardens before the obligatory rain started. Only 50 of the 1441 rooms are open to the public (our tour only did 40). It was a wedding gift to Maria Theresia from her father the Emperor. Colleen wants to apply as a tour guide. She promises not to repeat herself 20 times like the one we had did. Innsbruck (back to mom): The last leg of our jouney has been the sunniest. We arrived Tuesday from Linz and Col met us at the train station. We dropped off our luggage at our hotel and toured the town. Looking at all the buildings, all I kept thinking of was the origianl movie “Frankenstein”. (C: wait what? not the Sound of Music?? where does Frankenstein come into play!?) 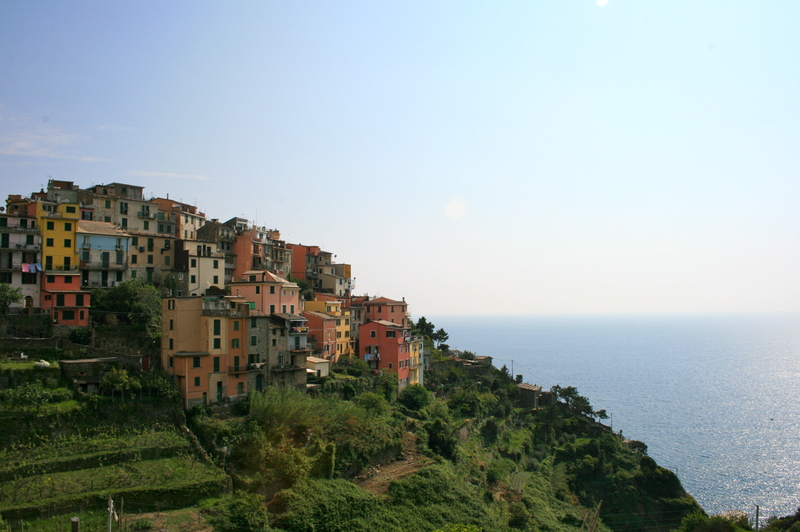 The villages, the music, the building facades. We ate at an “Italian place”. Go figure- Colleen was ready for a dietary change anyway- We were able to sit outside and enjoy good food and wine. Wednesday we were able to connect with our neighbors John and Rosa Ernst who had been in Alpach for 5 weeks. They picked us up at the Innsbrook train station and took us back to show us where they’re staying. A very nice slef-contained village, overlooking some beautiful green, lush terrain and mountains with snow visible on the peaks. We stopped in a few towns (Rattensburg and Kitzbuehl), walked around, had a great lunch (finally I had Wienerschnitzel. C: not in Wien (vienna). go figure), got back in the car where John proceeded to take us up in the mountains so we could view a hidden waterfall and more spectacular landscapes. 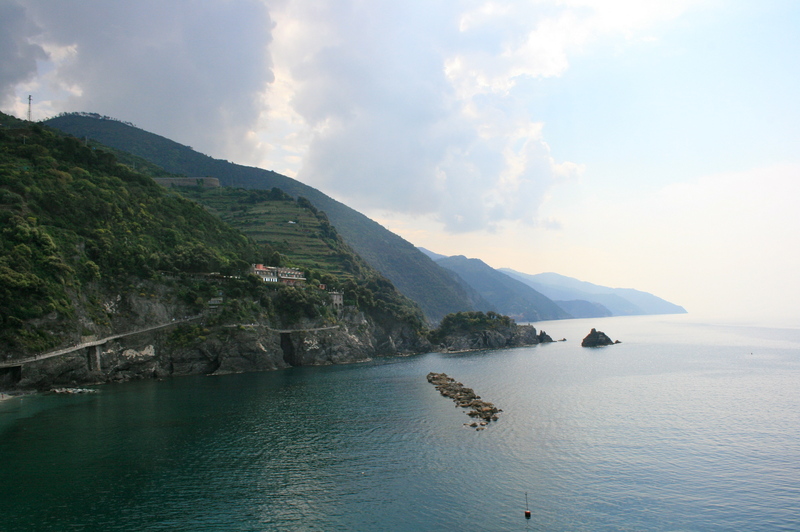 On our way down, we convinced our driver to stop for coffee and… pastries. A beautiful view of the mountains again and good company. Thursday found us taking a cable car up 826 meters to a 2 hour hike. It was a beautiful sunny day and a great way to burn off calories. Once again great views from on high- really brings a sense of peace and calmness when you’re out of the city. We came back down, had lunch, did a little more shopping, and now we are headed back to Munich to fly out Friday. As I sit on the train, Tim reads and Colleen sleeps, I look at her and know it’s going to be hard to say goodbye again (she’ll be home in 3 weeks) but I also see a very mature, confident, secure young lady who has truly enjoyed the experience and will do well wherever she goes. Mom was definitely ready to head back after her first continental European extravaganza. Dad on the other hand, really likes the idea of all these vacation days and can’t wait for 2 weeks in Michigan in August. That’s all for now, have to get back to my homework/essays, it never ends. Hope everyone had a happy 4th! 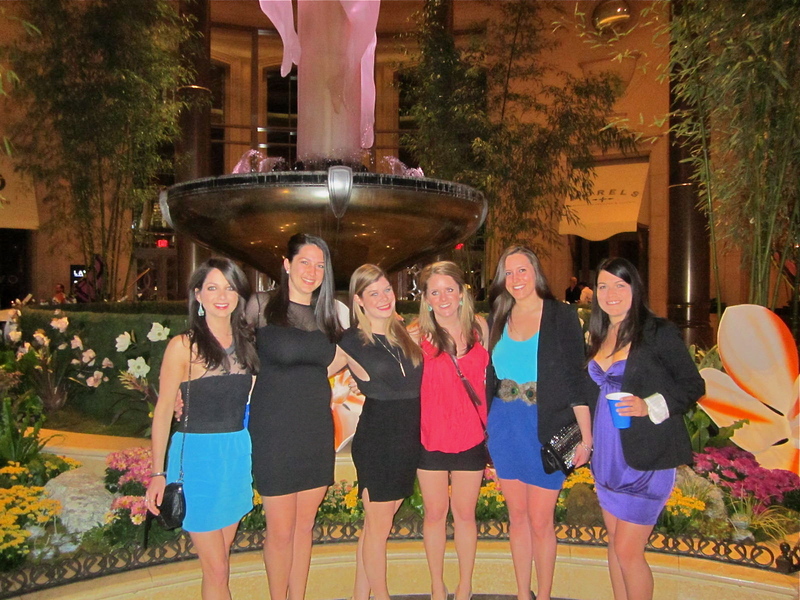 The girls on Becky’s 21st birthday!! Tuesday: NO CLASS! but wait, this usually means grocery shopping, running errands (like today, I bought train tickets to Vienna for my parents and I when they come in June), doing homework, photocopying articles for classes, etc. Then lacrosse practice at 7, but to get there on time I usually leave by 6. 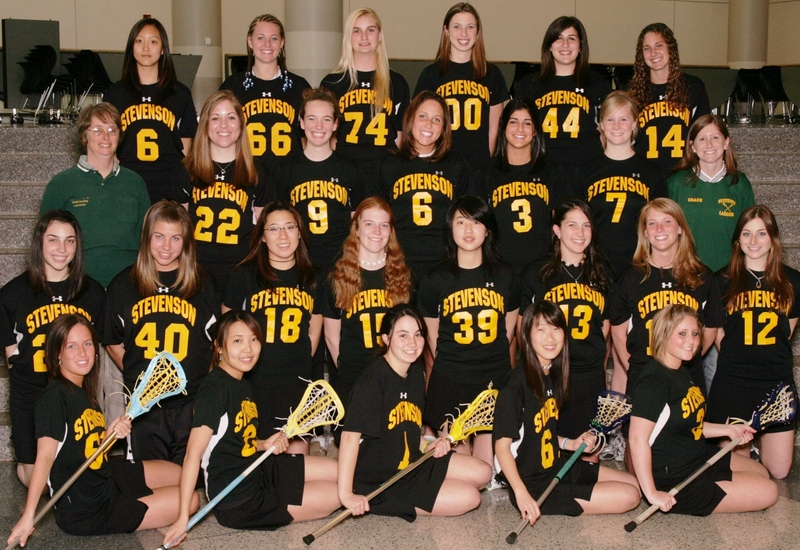 Guess I should mention that I joined a lacrosse team here!! I haven’t played since high school, but it wasn’t too hard to get back into it. 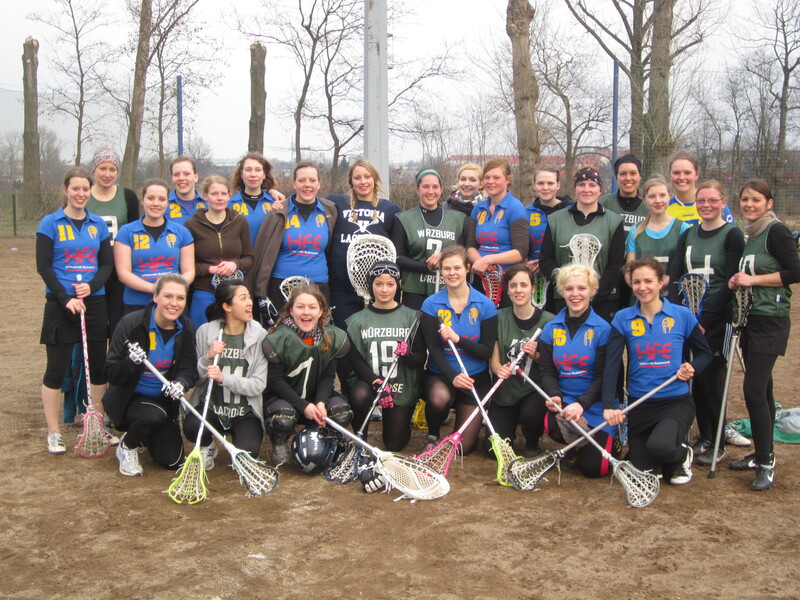 Lacrosse isn’t too big over here, and Munich is actually the only city that has 2 teams, A and B. I’m currently playing on the B team since I don’t actually pay to be part of the club and am only here for a few months. This past weekend the A team won the Bayern region (the state Munich is in) which means they’ve moved on to the final 4 in two weeks! The men’s team has moved on to the final 4 as well! Hopefully we can win them both. Last night, the mens and womens teams met together at Ned Kelly’s Australian bar downtown to watch the NCAA mens lacrosse championship between Cornell and Syracuse (I’ll let you think about that clash of nationalities- German/Australian/American?) It was an AMAZING game and I’m sorry if you didn’t watch it. I was cheering for Cornell and with them up 9-6 I thought they had it. Unfortunately, Syracuse came back to tie it with 4.5 seconds left and then win it in overtime. Wow. Becky and Line in front of the Chinese Tower beer garden in the Englischer Garten. We’ll see Line again this weekend in Berlin! Wednesday: German grammar class again, 9 am. Yuck. At the maypole on May Day! Friday: NO CLASS! (what a life, I know) Lacrosse practice again (then again on sunday). Homework smushed all in between and of course lots of visitors, playing tour guide, and enjoying German beer and sausage culture. Occasionally we change up the standard ‘here is Munich’ tour and take day trips. For example I’ve gone to Salzburg and Schloss Neuschwanstein with friends, but I’ll go into those more next time!